Really? Temps of over 100 degrees near the beach? It’s obvious to me that summer has decided not to be a good sport this year and is refusing to relinquish its oppressive grip. It’s well into September, which usually means that I should be considering dragging out the stew pot and deciding between a nice beef Burgundy or maybe a simple leek-and-potato soup. Clearly, not yet. I sound as if I’m whining but it’s really not a tragedy. I love warm weather food, just not warm weather. And while I don’t want to expend a lot of effort cooking in the heat, I do want plenty of flavor. With that in mind, I thought I’d toy with one of my favorite Vietnamese restaurant lunches – the marvelously simple Bun Ga Nuong. 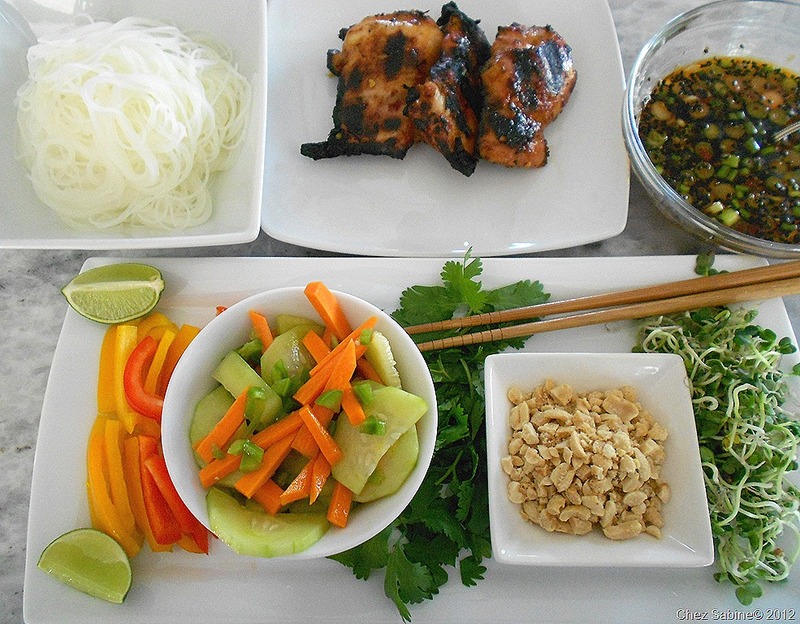 This refreshing salad bowl combines skinny white rice noodles (bun) with cool, crisp veggies, warm grilled marinated chicken and the obligatory nuoc cham. The latter being the dip/drizzle made with fish sauce. My version contains the essentials, but I’m totally tweaking that fish sauce, which always is my least favorite part of the dish. 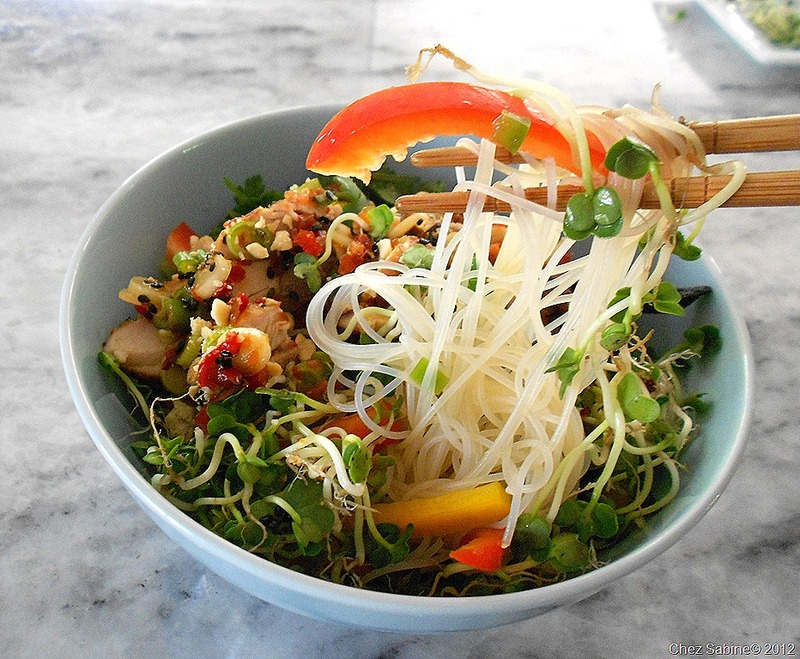 I find nuoc cham usually a little flat, and since this dish is really a salad, I want more acid than nuoc cham provides. And, so, I created an Asian vinaigrette with a chili punch that pretty much won’t be ignored when you drizzle it on the dish. With each bite, you’ll get cool crunch from the vegetables combined with the slippery feel of the noodles set off by spicy-sweet marinated grilled chicken and a dressing that includes chilies, fish sauce and rice vinegar. A perfect play on warm, cool, hot, sweet and salty. It’s easy to prepare. You can do a lot of the prep ahead of time and put it all together at the last minute. And this dish allows you to improvise since it’s made up of equal handfuls of noodles, pickled vegetables, herbs, chopped lettuce, sprouts of your choice and grilled chicken accented with dipping sauce. Oh, and a garnish of crushed peanuts. I don’t always use lettuce, and I mix up my herbs. For instance, I had cilantro but my basil seemed to have been invaded by something that turned the leaves translucent. No kidding. And I had some pineapple mint (I really do like a little mint in this dish), but I totally forgot to grab some until it was too late. Not a problem. For me, cilantro is the herb that shouldn’t be forgotten. And it wasn’t. If you’re not in the mood for chicken, my marinade will work equally well on prawns, pork (try a tenderloin) or even beef (I’d go for a tender cut). And I’m not a fan of bean sprouts, so I found daikon sprouts that worked beautifully. See? It’s totally up to you.